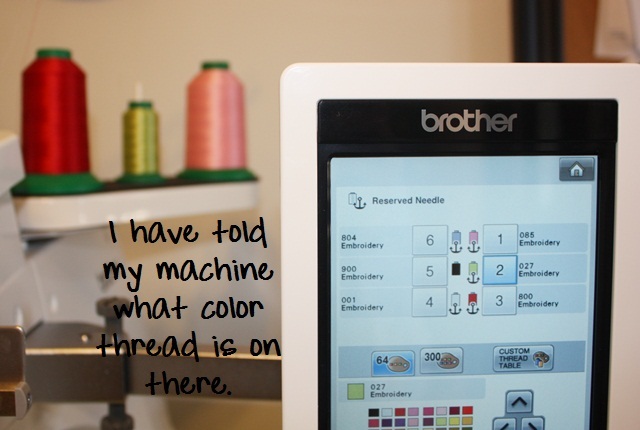 Here is my followup post on APPLIQUE on the Brother PR650. 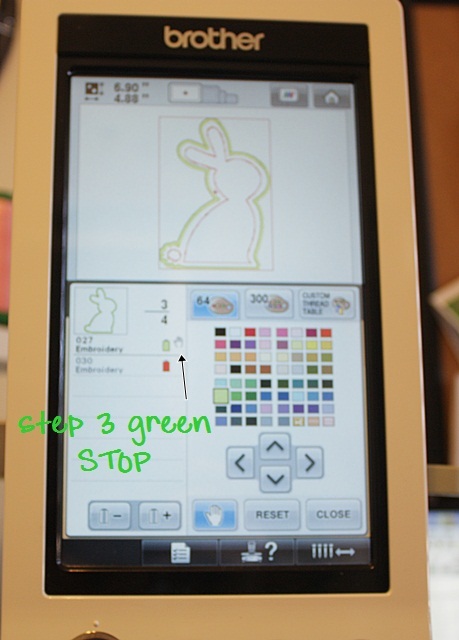 This is a simple (new) Bunny Applique Cafe design I sampled this past week. 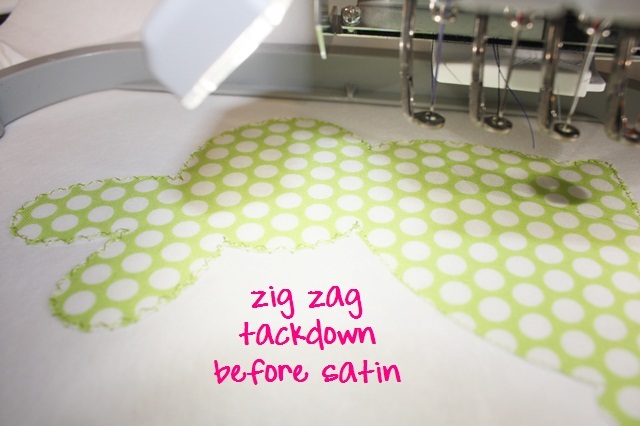 I get asked a lot by newbies if I include instructions on my applique designs. The answer is THREAD CHART! 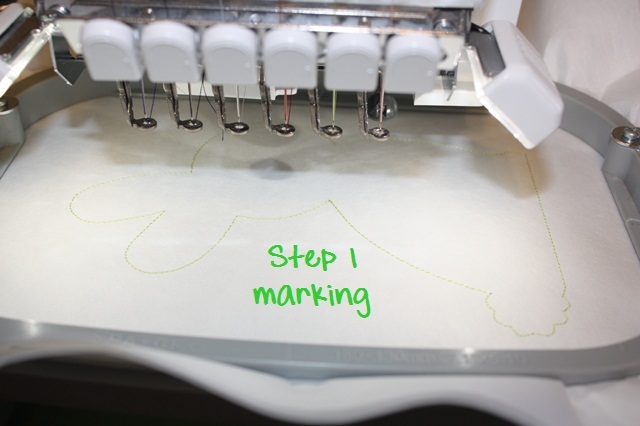 We include a thread chart which includes an image of each step. I ignore the thread colors because I am going to pick out whatever thread colors I want to use based on the fabric I pick out. You would typically use the same color thread for marking, tackdown & satin, but in digitizing, these colors MUST be programmed (digitized) differently. This tells your machine to STOP! You see below 1. Marking, 2. Tackdown, 3. Satin and 4. Inner stitching on the bunny (which could be left off). 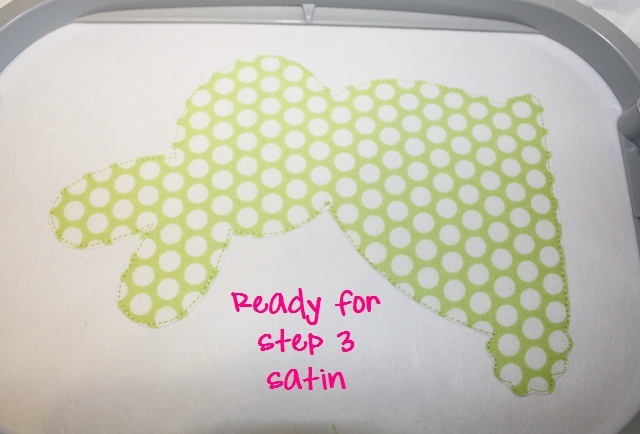 This 3+ step process applies to all applique designs ~ 3 steps per fabric (marking, tackdown and satin). Then factor in eyes, nose, inner stitching like this, etc. 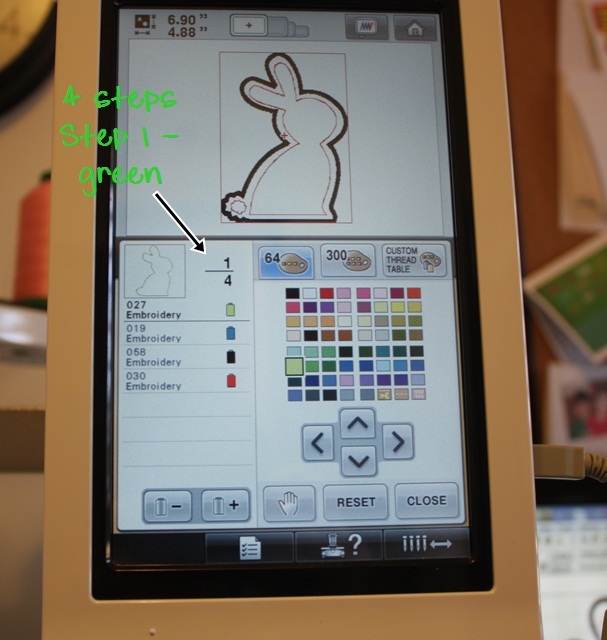 Here I have saved my Bunny design on to my machine via the USB Cable connected to my computer (E:/ drive on my computer). As you can see, I use Sew What Pro on every single thing I sew! Even if I’m NOT editing or merging, I LIKE to see what I’m doing on my computer screen, so I always pull my designs up using SWP before I save to my machine. Note that the bunny is upright ~ later I will rotate it to the left so it will fit in my 5×7 hoop. 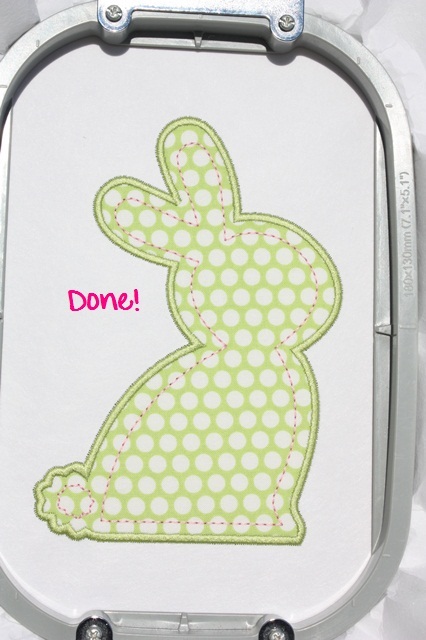 I have chosen a green/white dot fabric for my bunny and I want to use a pink inner stitching on him, so I have put my colors on needle 1 (pink) and 2 (celery green). I have “told” my machine that I put pink and light green on it, as you can see I anchored these colors below on needles 1 and 2. 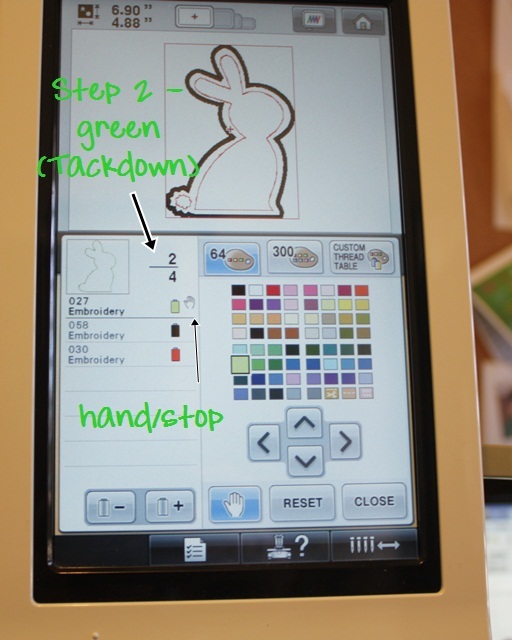 This is how I was taught, so this is how I assign colors on my machine. 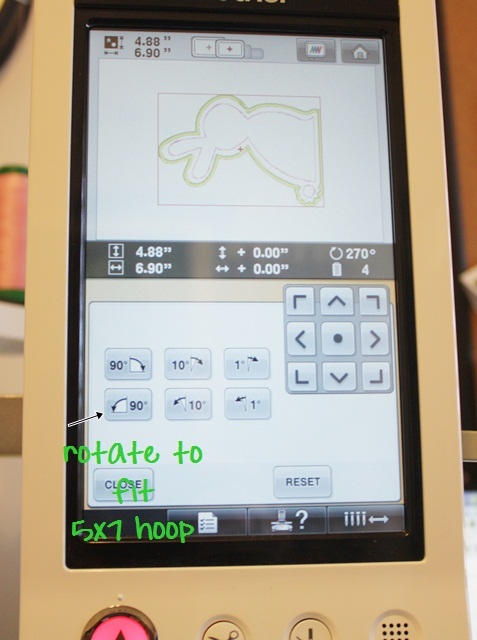 Now my machine knows that light pink is on needle 1, lt green is on needle 2, red is on needle 3, etc. Needle 5 is black and is not anchored ~ the machine will only allow you to anchor 5 colors and the non-anchored needle is a free agent. 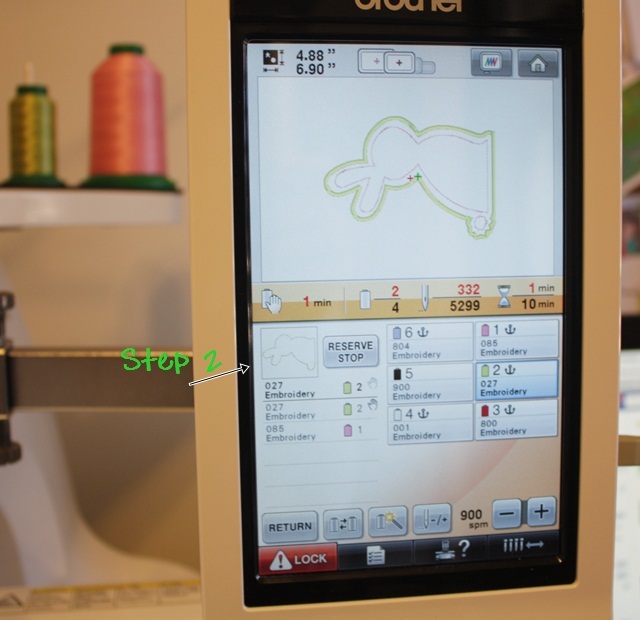 Now we go through the steps to tell my machine which colors to use when sewing each step. Step 1, I assign the same light green color that I told my machine was on needle 2. 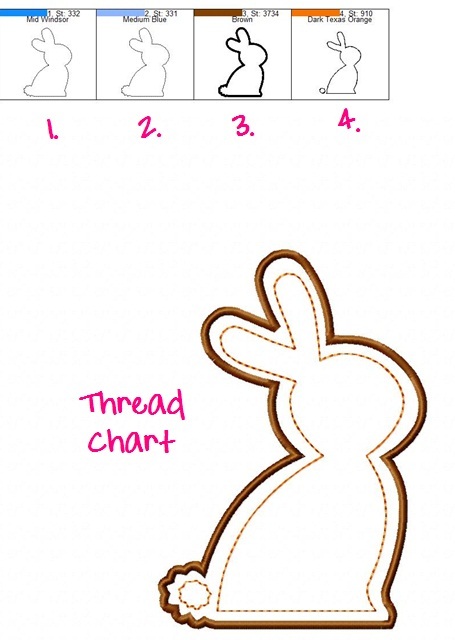 Step 1 will be my marking stitch, which will be an outline of where my fabric should go (the shape of the bunny). I then press the “+” button to move on to step 2. 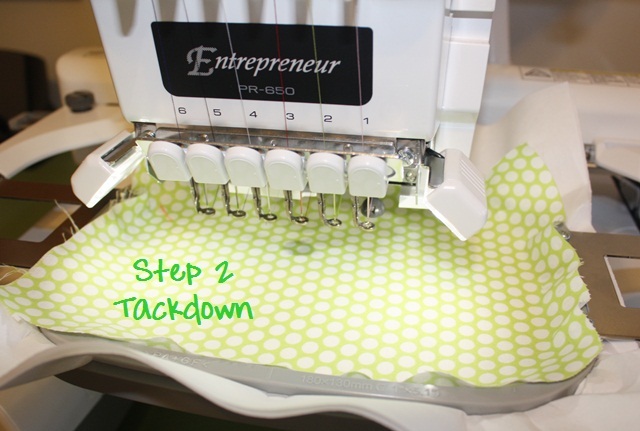 Step 2 is tackdown and I want it the same light green as Step 1 and needle 2. Since I am laying fabric down before the tackdown stitch, I press the HAND, which tells my machine to STOP before step 2. This will give me time to lay down my fabric. I will then press the “+” again to move on to step 3. Step 3 is our satin stitch, which is the finishing stitch around the design. I want it the same light green and since I’ll need to TRIM my fabric before the satin stitch, I press the HAND again which will tell my machine to stop before Step 3. I press the “+” button again to move on to step 4 (our last step). Step 4 is the inner stitching on this design, and I chose light pink which I assigned to needle 1. Since there is no need to stop before this step, I do not press the hand, and my machine WILL NOT STOP after the satin stitch. It will change to needle 1 and stitch the pink inner stitching. 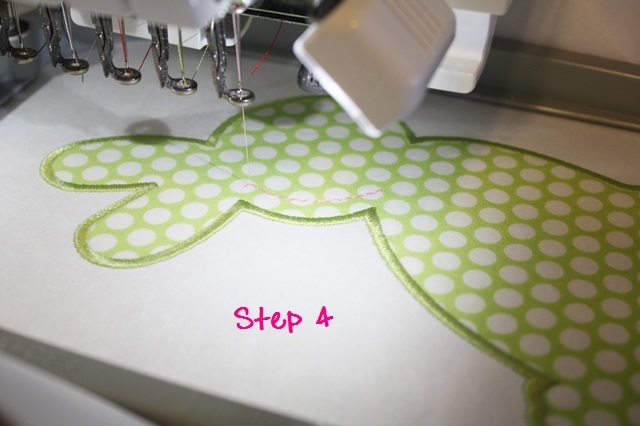 *During this 4 step applique design, the machine will stop FIRST to let me place my fabric down and a SECOND TIME to let me trim my fabric. As you can see, the bunny is still upright and it’s showing it will only fit in my biggest hoop. Now that I’m done assigning colors, I can rotate it to fit my 5×7 hoop. Press CLOSE after assigning colors! PS. 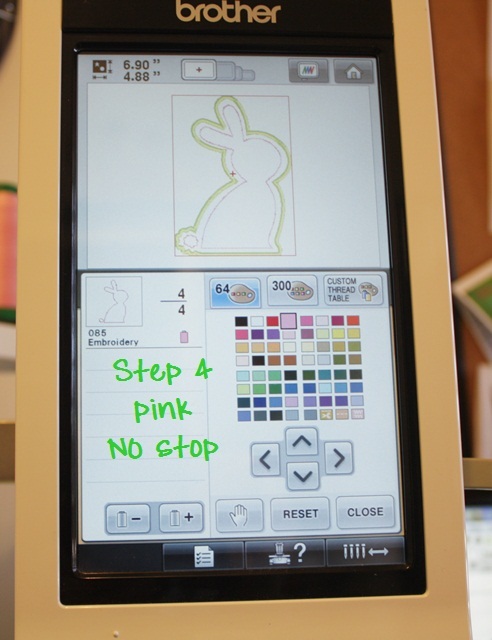 This machine has a touch screen, so you simply press each color with your fingertip to assign the colors. I had a PR600 that was NOT touch screen, so you had to arrow up and down, left and right to get to the chosen color. Now I rotate the design 90 degrees to the left so it will fit in my 5×7 hoop. As you can see, the design is 4.88″ X 6.90″. Press CLOSE when you are done rotating. You are now ready to SEW, so press the SEWING button (not shown). It will pull up this SEWING SCREEN. As you can see, this design is 5,299 stitches and should take 10 minutes of sewing time (does not include preparing fabric or trimming). My machine is set to 900 SPM (stitches per minute). The max is 1000. You can also see which colors are assigned to my machine (right side) and each step and the needle my machine will use to sew it (the list on the left). If I have accidentally chosen the wrong shade of green or pink, there will be a line on that step telling me I’ve chosen a color that is not anchored on my machine. It will default to the free needle (black) which is not anchored if I don’t correct it. If I’m paying attention, I will go in and fix this and select the correct color! I think the machine also beeps and says something as a warning. 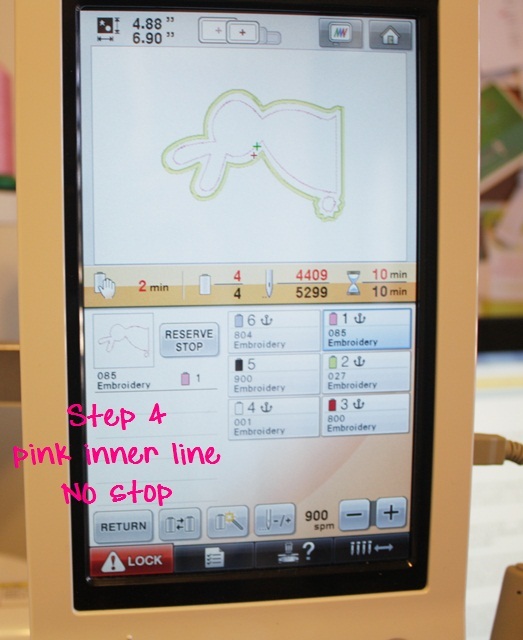 Step 1 – needle 2 (green), STOP Step 2 – needle 2 (green), STOP Step 3 – needle 2 (green), Step 4 – needle 1 (pink). It will STOP before step 2 and 3, giving me time to lay my fabric down and also trim before the satin stitch. Time to SEW! To sew each step, you press the LOCK button to unlock the needles (safety feature) and the button below it (which is red in the above photo) will turn green. You press it to start your machine. In the photo above you can also see other buttons: needle -/+ is your back up, go forward feature if you ever need to back up. You can back up or skip ahead by complete steps or by stitches (1, 10, etc). 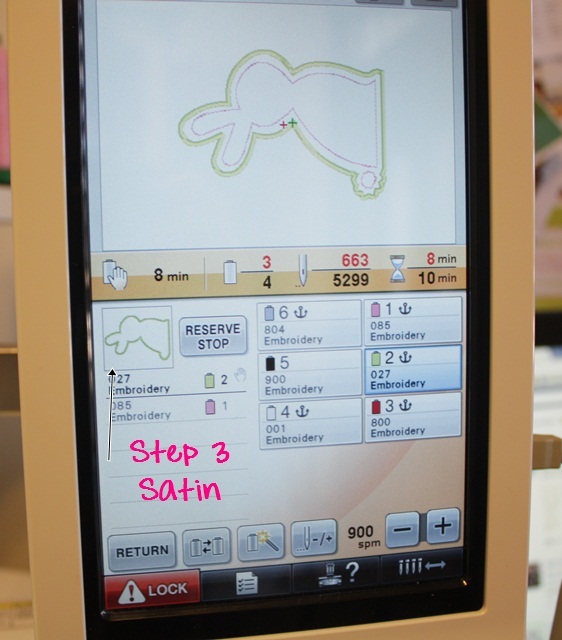 As you can see, there is an image of each step on the machine sewing panel. After marking I’m ready for fabric, which has HEAT N BOND LITE on it. Peel the paper away (of course) and lay down your fabric. The machine has stopped because you told it to (the HAND) before step 2 (tackdown). Ready for satin stitch (step 3) so time to TRIM. 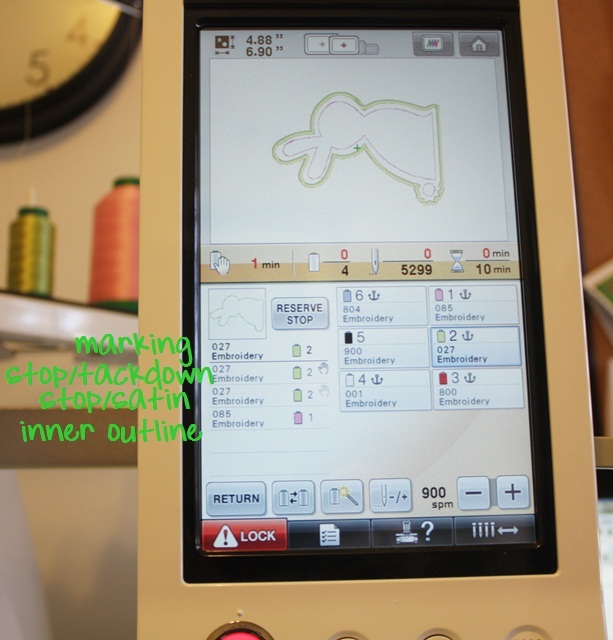 Your machine has stopped since you programmed the hand = stop before the satin stitch. Time for that inner stitching which I’m doing in PINK. My machine will not stop after the satin stitch since I did not program in the HAND/STOP, but will keep going with the pink inner stitching. 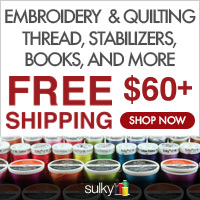 ***This is a wonderful feature of any multi needle machine! 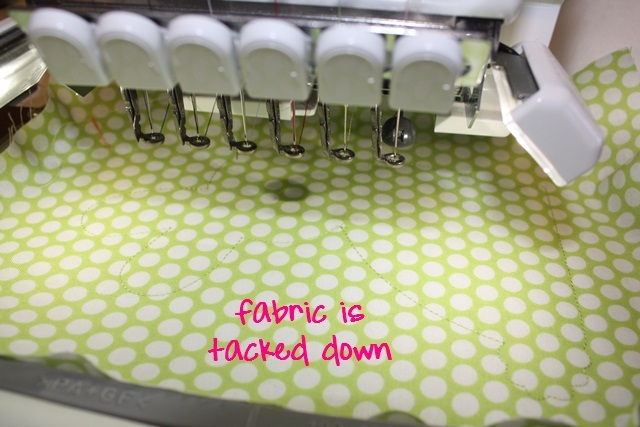 When doing an applique, once all fabric is down, you can program your machine with the thread colors and it doesn’t have to STOP for you to change colors! If this bunny had eyes and a nose, it would keep on sewing, changing needles/colors automatically! I hope this helps! It really is EASY and once you get the hang of it you can program all this in a matter of a few minutes. There are other features of the machine, but I don’t want to get too confusing. For example, if you are in the middle of the design and decide you want to use a different color, you can either 1. STOP the machine and change out the thread color on the needle you’ve programmed or 2. use the MAGIC WAND to change needles/colors. I’ll save that for another post! This is a follow up to these posts: Brother PR650 and Brother PR650II. All of these posts can be found under HELPFUL POSTS on my blog tool bar. Great post!! Very detailed!! Love pictures! I want this machine so bad now!!! I’m so jealous! This machine sews so much better than mine!!! I have just gotten in to all this about 4 months ago. My machine is not as advanced as this one by any means!! I hope some day I can afford a machine like this!!!! I have started a little and I mean little business so it will take me a while before I can get it!! Continue with the posts, I love learning!! Thanks again for sharing with us!! This is so helpful for me. 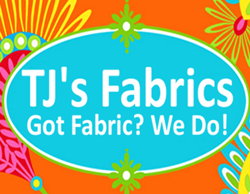 I think you should have hands on lessons from your sewing room! 😉 Guess this is close enough. You really give great detailed information. Hope your business continues to succeed! God Bless! Thanks R! You are so generous with your time and knowledge. You did a WONDERFFUL JOB EXPLAINING this! This design would fit in your 9 by 9 Durkee right? Oh by the way your ears should have been burning today. I was sharing your blog with lots of people at an embroidery workshop I was attending. What software do you recommend for digitizing? Again thank you so much. I did the research on price as you suggested and bought the 650 this week! Today, I went for a tutorial and was on over load…so much to absorb. Just learning how to do the maintenance and threading was enough to take in. Thank you SO MUCH for this tutorial, as I will be reading and re-reading it many times over. Your photos and instructions are great! 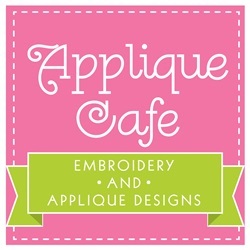 I look forward to learning more about my new machine and trying all those wonderful Applique Cafe designs I’ve purchased! Once again, THANKS A MILLION!!!! Congrats!! You’ll be a pro in no time! Again, can’t say thank you often enough! I was so afraid to start with my PR650 and your tutorials are walking me through steps…love them….please continue and then please consider publishing a HOW TO FOR NOT SO DUMMIES afterwards. I would love to have a compiled list of these lessons when I teach my great-niece some day. Thanks again, you are God’s blessing to us. Thanks for the great tutorials! I love your designs and reading your blog. 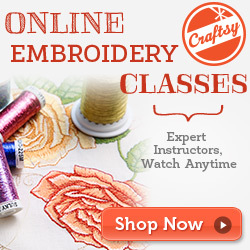 Thanks for sharing such great embroidery information. I can’t thank you enough for you helpful post!! You have been with me every step of the way. I can’t tell you how much this has helped. Your getting me through my first applique as i write this!! This is awesome! Thank you. I have a question though. Can I save the thread assignments and thread stops so I can sew this again later without having to set it all up again? You can save the design (with however you have the colors assigned) to your machine memory! You have taught an old dog many new tricks!! Absolutely love the the detail pics & descriptions on all of your tutorals. But, I still have a question, how do you monagram on the applique? Is this something that can be done on SewPro or another software program wether its a trio design or mongramming under a design. I have been embroidering for some time, just was intimadated by qpplique and now ready to try. I have a six needle babylock, the cousin to the brother machine. Yes! 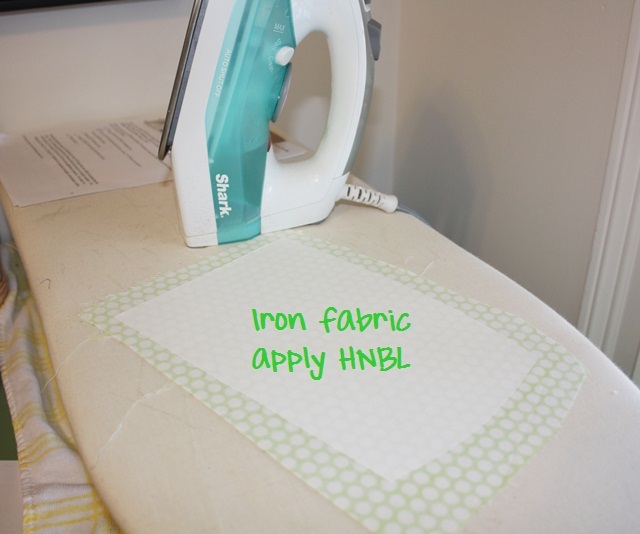 In Sew What Pro you can merge the monogram on to the design, then sew it all at once! 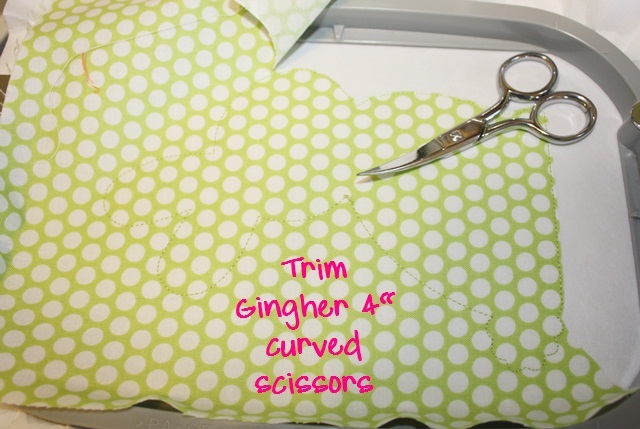 It allows you to space everything in the design before you sew! What Pro the same as Monogram Wizard plus? 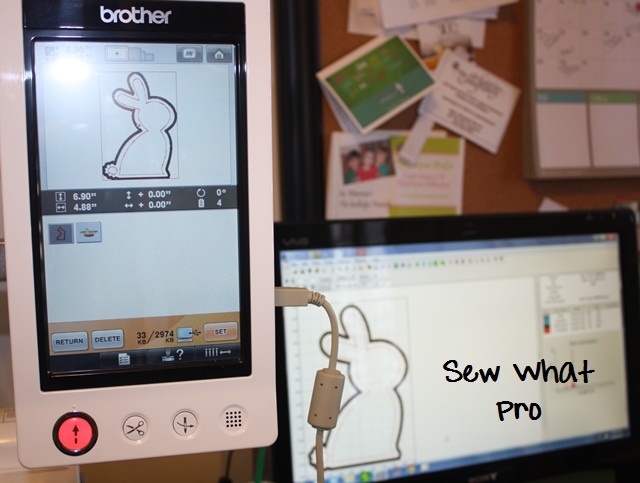 Sew What Pro is a merging and editing software. MWP is a lettering program – monograms, names. They are different! Thank you so much for this post. I bought the Brother PR655 last week and today tried my first applique “Simple Spider.” It was confusing but your post has simplified and answered my questions. I like setting my colors by anchoring too. Steve @ sewingmachine.com showed me four ways. It’s a learning curve that I am looking forward to. Thank you so much for taking the time to create this blog. I have had my PR655 for almost a month now and am still having problems with programing thread colors. When I found this I was so relieved since I have made trips to the dealer and asked, reread the manual, gotten frustrated, embroidered in wrong colors, etc. Finally, something that is simply yet competently done. You have done a great service! I am now going to try again, knowing I can go review if I need to and I will get it correct, this time. Again, thank you so much. By the way I have some of your designs I bought to use on my single needle Ellageo. So, first — I’m so thankful for your blog! Not many people are that willing to help, and I feel like there are not enough resources online for these machines. I just upgraded to the PR655 from a single needle Bernina. I LOVE it, but it’s SO different! As far as things like a monogram appliqué, is there a way to do all three initial placement stitches, lay down the fabric for all three initials, then the tack down stitches (and so on,) all at once? My single needle would recognize it that way bc of the changing in layer’s color of thread. I feel like by doing it that way, instead of each individual letter, your fabric stays straighter, and it seems like it would be less amount of time… Sorry if that doesn’t make sense. I tried, haha. Also, I notice on the color chart, they have the “Applique”, “Applique Material”, and “Applique Placement.” Does your 650 have that option? I’m afraid to try it. I’m in Birmingham and bought the machine in Atlanta… I got there 30 minutes before they were closing and didn’t get a chance to ask a lot of questions! You could skip ahead and then go back to stitch all the fabric at once. Or, I would use Sew What Pro to edit the colors of the 3 letters and the steps and could manipulate it to stitch all letters first, then all letters tackdown, then all letters satin. Not sure if that makes sense? I am not familiar with “Applique”, Applique Material & App Placement?? Is that a feature on the machine?? Thank you for all your post, you are amazing! I have the same machine as you in this post, my problem is my machine does NOT stop when the hand is inserted as you instructed. Any suggestions on why or what to do to make this work? I am making 70 small in the hoop projects for my grandkids classes and I really need the machine to stop without me standing there the entire time it’s stitching. Please help. What if you hit Reserve Stop? I think that’s what the button is. I wonder why yours isn’t stopping!?!? I did find this thru Google: Might be worth checking!? If you do not see the hand and spool icon that means that your Manual Color Sequence option is turned on. – Go to Manual Color Sequence and select OFF.